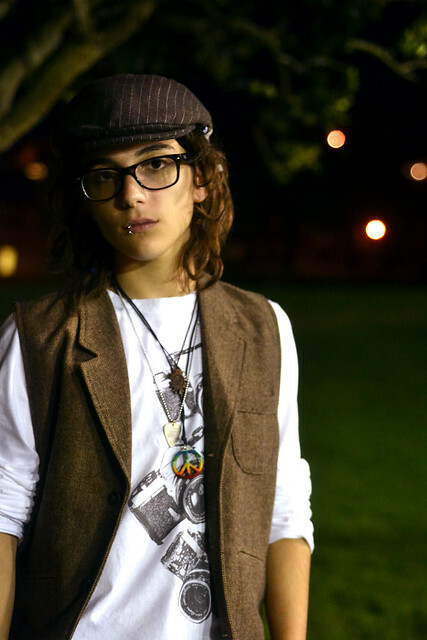 New York native Ryan Otto Cassata, 18, is a transgender singer-songwriter, motivational speaker and freshman at SF State. Photo by Andy Sweet. When Ryan Otto Cassata stands up with his guitar at Dolores Park Café, he seems like a normal 18-year-old. But there is something different about him. Cassata always felt a little different than everyone else, but didn’t notice what this feeling meant until he met a transgender for the first time. Cassata, born a girl, didn’t feel like a girl. He felt like a boy. This summer, Cassata moved from New York to San Francisco to study at SF State. He is a motivational speaker, singer-songwriter, activist and first-time freshman. Cassata came out as transgender when he was 14 years old. His mother didn’t take it very well. “I had to come out to her several times because she didn’t really believe it. I think she didn’t want to believe it. She was in denial. I guess I can understand that. Adjusting to anything new is hard,” Cassata said. His dad wasn’t supportive either. “I have two brothers, so I was the only daughter. I think that was hard on my dad,” Cassata said. High school and middle school were hard as well. Cassata was bullied and asked why he sounded like a girl. He didn’t take hormones, but did have chest surgery. Being together didn’t start off easy. Although Borksy said that the couple fell in love at first sight, coming out for the relationship wasn’t easy for her. Her parents kicked her out of the house as soon as she told them she was in a relationship with Cassata. “Ryan supports me in every way possible. I never got that from my parents,” Borsky said. Cassata understands that people are scared to come out of the closet, and tries to inspire and support them through giving speeches and writing songs that he uploads to YouTube. “Hands of Hate,” one of his latest songs, received 21,660 views. In 2011, he received the Harvey Milk Memorial Award. José Bonilla attended Cassata’s performance. Bonilla supports the LGBTQ community and Cassata’s activism. “What’s not to support?” Bonilla asked. At SF State, Cassata mostly hopes to enjoy the college experience to the fullest and inspire people. Cassata also plans to give a speech to the Queer Alliance on campus Sept. 25. After joining a Long Island motivational speaking team, he got calls to do other speeches without the team, in particular about being transgender. “I’m really an open book, and I want to be as visible as possible to give the transgender community a good name,” Cassata said.